10th July, Changlang: The people in Holy Rosary Parish, Laktong, Changlang had every reason to smile and celebrate on 21st March 2013, when they witnessed a big gathering of Priests and Religious and large number of faithful from all over the Diocese for the blessing and consecration of the Holy Rosary Church here. Laktong is in the Changlang District of Arunachal Pradesh. Since it is the district headquarters, we have here a mixed population of different tribes, with the Singphos and the Tangsas being the majority. We also have people of other tribes like Noctes, Wanchos and a few non-tribals. 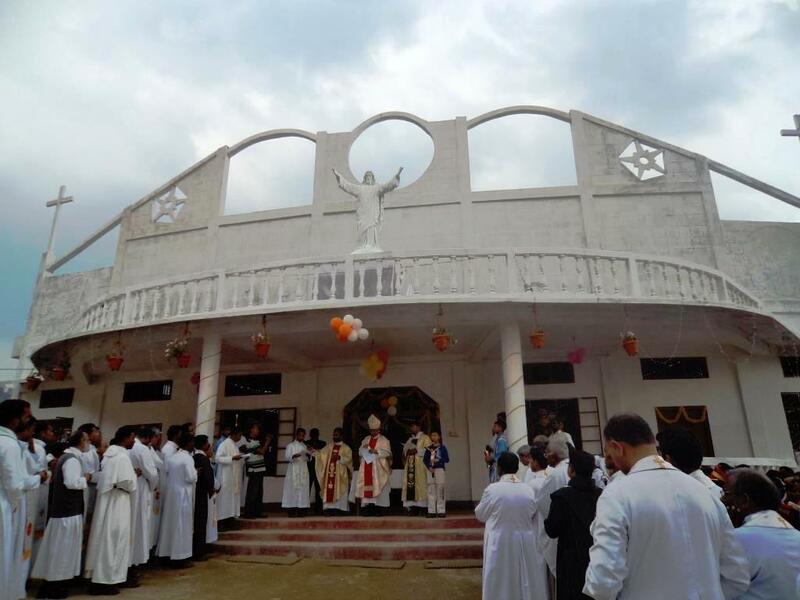 It is one of the old mission stations in the Diocese with a big active and vibrant Catholic community that had its Mass and other Liturgical Services in a humble structure made of bamboos and tin sheet roof. Now with the new Chapel replacing the old one, the community will grow in numbers and in Faith. The Construction of this Chapel was completed in a record time of few months only. Since the Diocese decided to have its Chrism Mass here in this place, our Bishop wanted to coin this important occasion with the blessing of this new Church. It was successfully completed and inaugurated and blessed by our Bishop George on the solemn occasion of the Chrism Mass Celebration in the Diocese on 21st March 2013. The presence of so many Priests and Religious from all over the Diocese made the blessing of this Chapel more solemn and prayerful. The people in Laktong village are extremely happy that their long standing dream of having a better Church in their village is fulfilled and at the same time are grateful to kind donors for helping them realize their dream. “We really thank God for fulfilling our dream today”, said Mr. Thomas Lowang while expressing his happiness on this occasion.